The painting is done on an austere mud base using one color, white, with occasional dots in red and yellow. This colour is obtained from grounding rice into white powder. This sobriety is offset by the ebullience of their content. 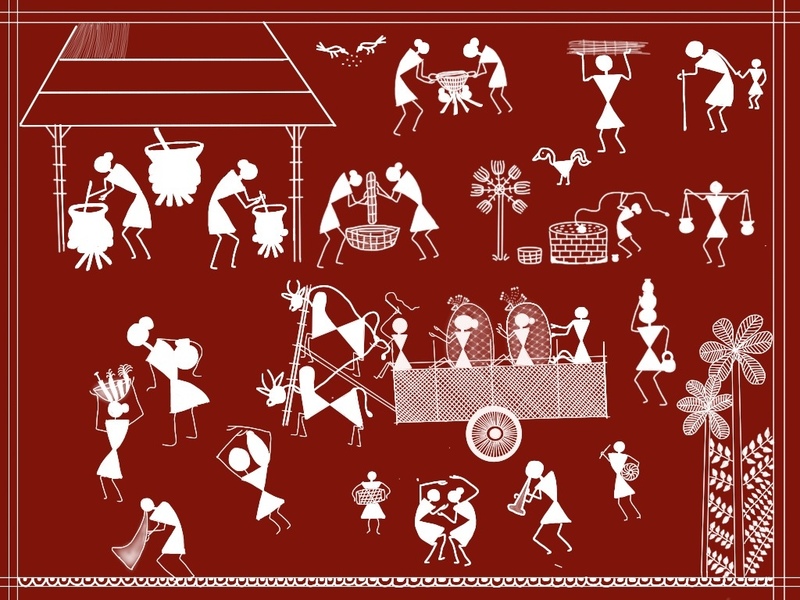 The depictions in the Warli paintings, which include marriages and other significant things are often considered sacred. These paintings also serve social and religious aspirations of the local people. Their extremely rudimentary wall paintings use a very basic graphic vocabulary: a circle, a triangle, and a square. The circle drawn from nature represents the sun and the moon while the triangle is derived from mountains and pointed trees. The square indicates a sacred enclosure, the square, the “chauk”; for the mother goddess, symbolising fertility. Scenes portraying hunting, fishing and farming, festivals and dances, trees and animals surround the central motif in these rituals. The Tribal values, the sense of uniformity and the close social interactions with nature and the spirits are what makes the Tribal who they are. For the Tribal people, life is an eternal circle. Death is not the end as much as it is a new beginning. Hence, circles best represent the art of Tribal, which has neither an end nor a beginning. The purpose of these drawings remain ritual as it did from ancient times, that of projecting and invoking power, virility, protection from unknown diseases, and the dark. The sacred nature of the trees is suggested by their soaring heights in relation to the men and beasts. Dances of spring, of budding trees, of the meeting of lovers, and the poise and abandon form an important repertoire in tribal vocabulary. Nothing is static; the trees, the human figures, the birds challenge and respond to each other, create tensions and resolve them. The art of the Tribal people symbolises man's harmony with each other and with nature. These paintings also supposedly invoke powers. Warli artists hardly use a straight line. Instead of a line, series of dots and dashes are made. However nowadays modern artists have begun to draw straight lines in their paintings. Many people have also started to use modern elements such as the bicycle, car, building, computer, spacecraft, train etc. apart from traditional themes. Artists are now shifting to paper and cloth paintings. 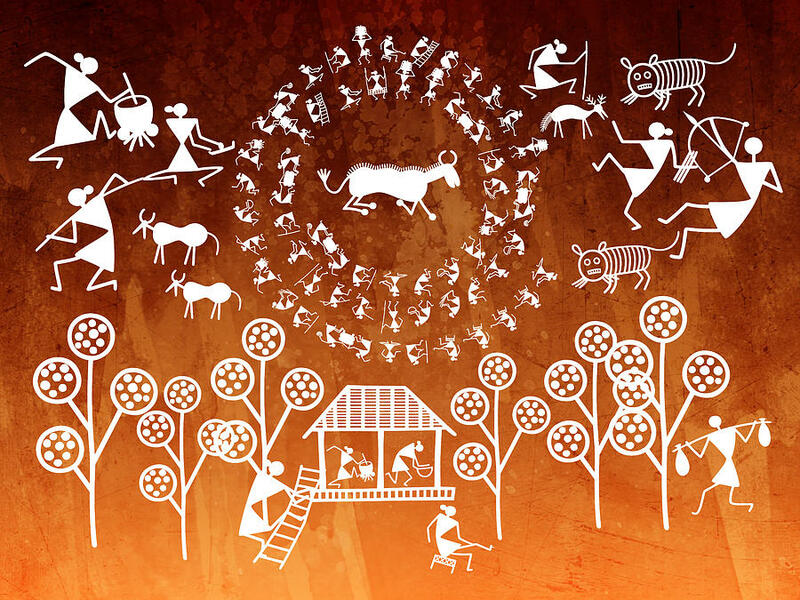 Warli paintings on paper have become very popular and are now sold all over India & abroad. Today, small paintings are done on cloth and paper but they look best on the walls or in the form of huge murals that bring out the vast and magical world of the tribal people. For the tribals, tradition is still adhered to but at the same time, new ideas have been allowed to seep in which helps them face new challenges from the market.